One person even claimed to have almost bought the burger after seeing a poster promoting the 'P. Ramly'. In a report by Berita Harian, PPIM head Datuk Nadzim Johan said that the Domestic Trade, Cooperatives and Consumerism Ministry (KPDNKK) should take action against the company for the "offence". "According to the Consumer Protection Act 1999, action can be taken against businesses who give a confusing picture about their goods or services," he said. The Malay daily also talked to several shoppers who found the use of the name 'P. Ramly' misleading and disrespectful. One of them even claimed that she almost bought the burger after seeing a poster promoting the 'P. Ramly'. Ninja Joe outlet in Tropicana City Mall. 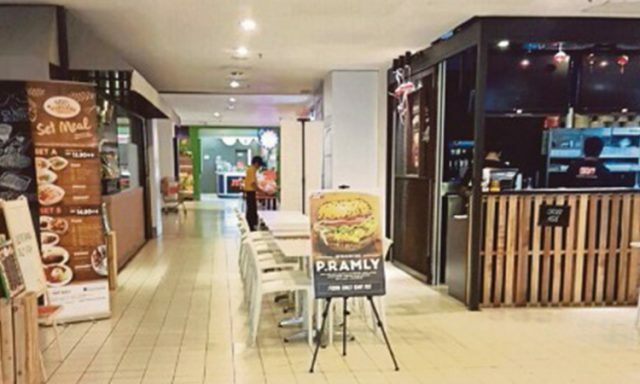 A shopper identified as Jasmin said that this issue is much more serious than the recent 'hotdog' kerfuffle, adding that the restaurant could've picked a non-Malay name to attract non-Muslims. Nur Alia, another shopper, said that the name 'P. Ramly' is confusing and disrespectful to the late P. Ramlee and Malay consumers, saying, "Even though the spelling is different, but it sounds almost the same. P. Ramlee is a big name in this country." Executive Nurhafizah actually claimed to have almost bought the burger after seeing a poster of the burger, saying that, "The advertisement was placed where people usually walk, as if they want to attract the attention of all consumers, including Muslims. This causes confusion." 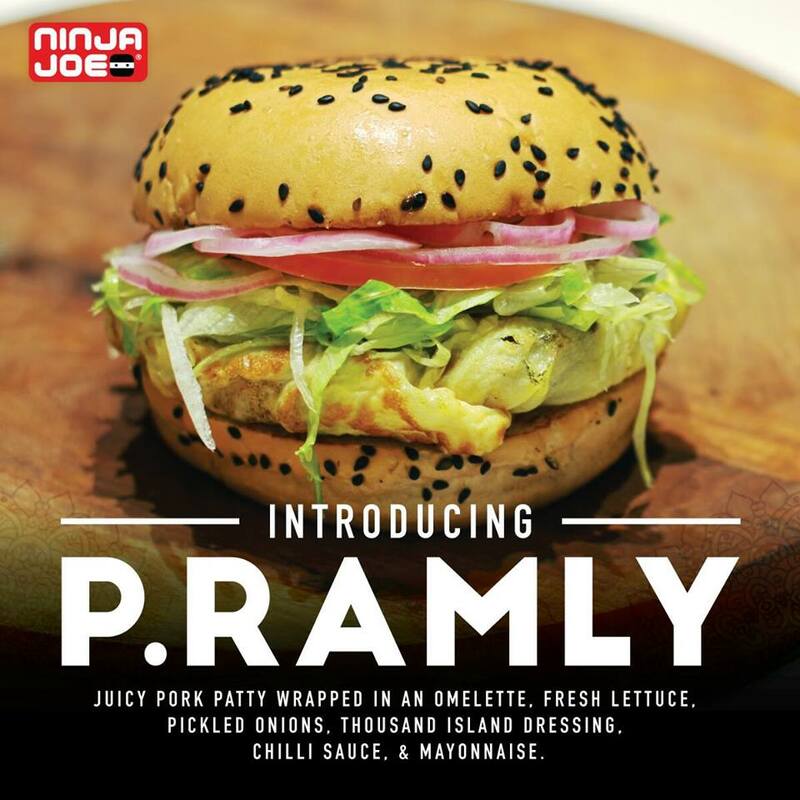 Non-halal fast food chain Ninja Joe introduced the 'P. 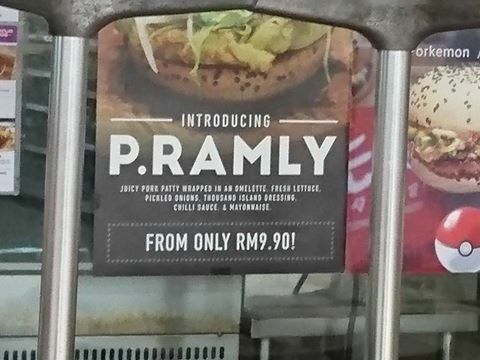 Ramly' on 31 August, with promotional posters clearly indicating the burger's ingredients which include a "juicy pork patty wrapped in an omelette"
An employee with the chain reportedly told Berita Harian that the "P" in the name refers to "pork", and that the name "Ramly" is common and synonymous with burgers among Malaysians. Ninja Joe has several outlets in Klang Valley, Negeri Sembilan and Melaka. The chain also operates a food truck that travels around Klang Valley. Check out their Facebook page here. It's not just about the Pretzel Dog. The list is really quite long.